There’s been an amazing variety of produce at the farmers’ market the past few weeks. It’s been another crazy, cold week here on Kaua’i. We spent all last Monday in sweatshirts, and the ceiling fans haven’t been on all week. I had planned to go swimming on Monday and Wednesday, but it was too darn cold. It finally warmed up on Friday, but was still cool enough we didn’t need to turn on the fans. The surf has been high all week as well – beautiful to look at, but not so good for swimming. One good side effect of the cooler weather has been that vegetables like broccoli and cauliflower are available – usually it’s too hot for them here. We got the sad news this week that our landlord has been diagnosed with malignant melanoma. He and Brett chatted for a while after he called to let us know that he (and his family) may be returning to the mainland shortly for treatment. He doesn’t currently know what the prognosis is (he’s still waiting on more test results), although he did say the cancer has spread to his blood. He wanted to let us know that our lease would be honored and that we were already OK’d to stay for another year, at the same rate, no matter how things turn out. We shall see, but so very sad nonetheless – he’s a nice guy and a good landlord. I’m also feeling a little bit of hope after a federal judge in Washington ordered a temporary restraining order against the travel ban. It doesn’t help those who had visas or were permanent residents who were already turned back, but now the executive order will get its day in court. It’s not over, but for now though all visas and green cards must be honored. We are a nation of laws, and for now the rule of law, and the separation of powers, stands. 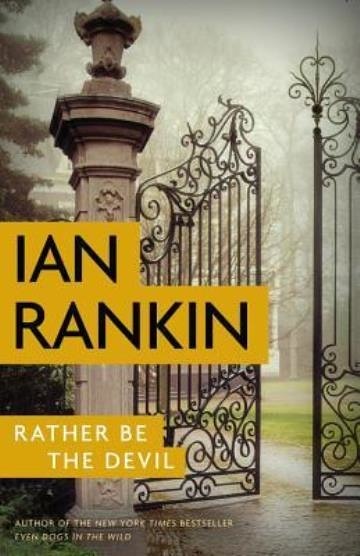 Reading: I started the new Ian Rankin book, Rather Be the Devil in the middle of the week and am ripping through it. Rankin is one of my favorite writers, definitely in my Top Five, and his Inspector Rebus procedurals are always a good read. I always enjoy that the city of Edinburgh is as much a character as any human in his stories. The Girl Before was also a good, tight read – I definitely recommend it if you like mysteries/psychological thrillers. I’ve got the new Tana French mystery, The Trespasser, coming up next. Listening to: It’s a beautiful sunny day, but the wind is howling! There’s lots of noise outside because of it, although it’s keeping the roosters quiet. The washing machine is doing its thing, but otherwise it’s quiet inside – YaYu is studying and Brett is reading. Watching: Neither Brett nor I watched any TV at all last week – we read instead, although YaYu “made” us watch Finding Dory yesterday afternoon, and I’m glad she did – it was a sweet movie. We’ve got nothing on deck this week coming up, but tonight Brett and I are going to watch Minimalism. Cooking/baking: Everyone did their own thing for breakfast this morning – I had a papaya. There’s still a little bit left of the yellow butter cake I made a few days ago, so no baking today. I’ve boiled the eggs for tonight’s deviled eggs and will be making those in a while for our dinner tonight. I didn’t even think until this morning that tonight’s snack-y menu makes it look like we’ll be watching the Super Bowl – we’re not. Happy I accomplished this past week: The sun finally came out and warmed things up on Friday, so YaYu and I went to the pool and I got my first swim in. Boy, am I out of shape! Not as bad as I thought I would be, but there’s still lots of room for progress. I did my research and booked a one-night Kaua’i staycation for Brett and I while YaYu is at her Key Club conference in April. I got all my bike rides done (with the tension turned up a notch beginning this week), drank all my water, and studied Japanese and Portuguese every day. Looking forward to next week: Brett and I are heading up to Kilauea on Wednesday to buy a gift or two for our granddaughter, and then plan to treat ourselves to a couple of banana frosties from Banana Joe’s. They’re pure fruit, so something I can eat without guilt. Plus, I love chatting with Joe whenever I go – he and I both share a love of Japan. Thinking of good things that happened: YaYu sold all her malasada tickets in two days, so her swim team banquet cost is covered and then some. She thought sellers would keep only $5 of the $10 for each ticket, but it turns out they get to keep $7 so YaYu will receive an additional $18 over the cost of the banquet. 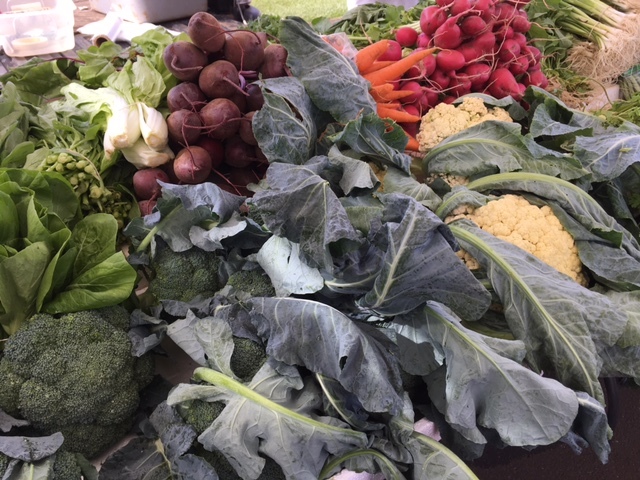 This week was another great one for produce at the farmers’ market – such variety, and so much to choose from! We put $18.05 into the change/$1 bill jar. Grateful for: Frugal and tasty peanut butter! I allow myself two tablespoons a day, and those two spoonfuls have saved me again and again from eating something I shouldn’t, either between meals or at night. I eat my serving slowly, and by the time I’m done the hunger pangs have completely disappeared (and stay disappeared). This makes me swoon . . . Bonus question: Do you have a favorite flower? Peonies have been my favorite for more years than I can remember. I never saw them growing up, but the first time I came across them in Japan I fell in love and that love has never waned. Whether they’re on the bush, in a vase or expressed in art, peonies always make my heart beat a little faster. My second favorite flower is the iris, with the petite, deep purple Japanese irises prefered over the larger, fluffier standard iris blossoms (although they’re all beautiful). I’ve added some other flowers to my list since we’ve been in Hawai’i: bird of paradise, Hawaiian ginger, plumeria and heliconia are favorites here. That’s a wrap for this afternoon at Casa Aloha. How was your week? What have you been up to? What good things happened for you? So sorry to hear about your land lord. Will pray for a good outcome for him. Well at least we’re not there with the weather not being especially cooperative! I love, love, love peanut butter too. I’ll bring you some Kroger organic brand (no refrigeration necessary!) when we come visit. It is delicious. When I was pregnant 27 years ago, I would eat it off a spoon like a lollipop or ice cream cone. My favorite flower is plumeria. By visiting you later this year, I’ll get to see many more! It has really been a strange winter here – much cooler weather than usual, although nice days pop up now and again. Yesterday it was the wind – I thought we were going to blow away! We get the organic peanut butter from Costco – delicious! Like you, I lick it off a spoon like a lollipop. It really goes a long way toward curbing any hunger pangs. Gorgeous produce available right now! Let’s see, good things. .. Both M & I finally caught whatever bug the boys have had. I was super sick yesterday, but am a little better today. I managed to pack 7 boxes over the past 2 days (lots of resting in between). Yesterday, I made pizza dough in the bread machine. By the time it was done, I was in bed, so we opted for a freezer dinner. I made the pizza (and calzones for the kids) for tonight, and also made homemade hummus (for a veggie tray), goat cheese crostini spread, and we are all set for the Super Bowl. I was super sick today (Monday) – had a terrible bout of food poisoning all night. I know what caused it too, because other than this one thing (sliced roast beef from Costco) I had all the same things as Brett and YaYu. My roast beef came from a new package we opened, so it went back to day and we got our money back. But that ruined today for me – it’s evening now and I still don’t feel all together yet. Whenever we moved I always goaled myself with a certain amount of boxes to pack each day. It was the only way to do it and make sure I got finished. Moving is such a pain – Brett and I have said next time we’re selling everything and will start from scratch again! Brett was my hero when I hurt my back – he did everything. One good thing that came from that was that he permanently took over a few of the chores, and still does them (i.e. laundry and evening dishes). Still reading The Greenlanders by Jane Smiley. It’s set in the 14th century and it’s a hard read compared to her “A Thousand Acres”. Went with a friend to buy honey from the neighboring beekeeper. Made a delicious pasta dish with sweet potatoes and spinach; can’t get enough spinach of late. Looking forward to an afternoon of scrabble with another friend tomorrow. Revelling in the late afternoon sun with sunset >5pm vs 4pm; we are going to make it through another Alberta winter. Listened to Jamey Johnson’s album, The Guitar Song, earlier this afternoon. It’s been a good day. Sounds like a perfectly lovely day! YaYu wants us to try eggplant lasagna one of these days, so I’ve got my eyes peeled for a regular eggplant at the market – usually all anyone has are the Chinese or Japanese eggplants, but the regular ones show up now and again.. I love Orchids of all colors but especially the big deep purple ones. My aunt had a plant with over 60 blossoms on it, absolutely gorgeous. I also like Christmas Cactus and roses. My mother had over 250 rose bushes at one time – Mr. Lincoln, Dolly Parton and Voodoo varieties were especially pretty. It is very difficult to grow hybrid roses in Florida as they require constant care. I had an old fashioned single petal rose until everything was torn down to build my house. It only survived because it didn’t require much care. That’s the only kind of plant I can grow. Orchids are positively lovely, but they take a lot of work. I call them “prima donnas.” Same for roses. They’re beautiful but hybrids take a lot of care and tending. My mom grew roses, but I could kill them in record time. My daughter-in-laws mother has an incredible rose garden (their house is called “Rose Cottage” in Japan) – I always love visiting there, although we’ll be going too early this year for them to be in bloom. Irises forever! My favorite are the tiny dark purples, but my garden is FULL of light blue/purple, dark purple/almost black, apricot, etc. Tulips are a close second, especially at this time of year — they say “SPRING” to me. Unfortunately, I can’t grow them, since our yard creatures eat the bulbs, or blossoms if they make it out. I just finished reading “Books for Living” by Will Schwalbe (loved) and “Everybody’s Fool”, by Richard Russo (OK, but less enjoyable than “Nobody’s Fool” IMO). My daughter in the UK sent me a Christmas subscription with an English bibliotherapist. I filled out an extensive questionnaire about reading likes, dislikes, favorite books and other quirky aspects of my life and they are sending me books they think I’d like. The first one came this week: “Red Love: The Story of an East German Family” by Maxim Leo. So I will be starting that soon. Looks fascinating. The little purple ones are the Japanese iris – so lovely and delicate. I love all the colors though of the more traditional iris – we had yellow, purple, and a yellow-purple blend in our back yard in Portland. I’ve got Everybody’s Fool on my “later” shelf at the library – it’s up after I finish The Trespassers. Richard Russo is a favorite authors. I’ll add the the Will Schwalbe book to the later shelf as well – sounds good.